Taiso Yoshitoshi (1839 - 1892) Lives of Modern People: Muraoka, Head Lady-in-Waiting of the Konoe Clan (Kinsei jimbutsu shi) 1887. Oban. Perhaps by today's standards we can consider this a political print. 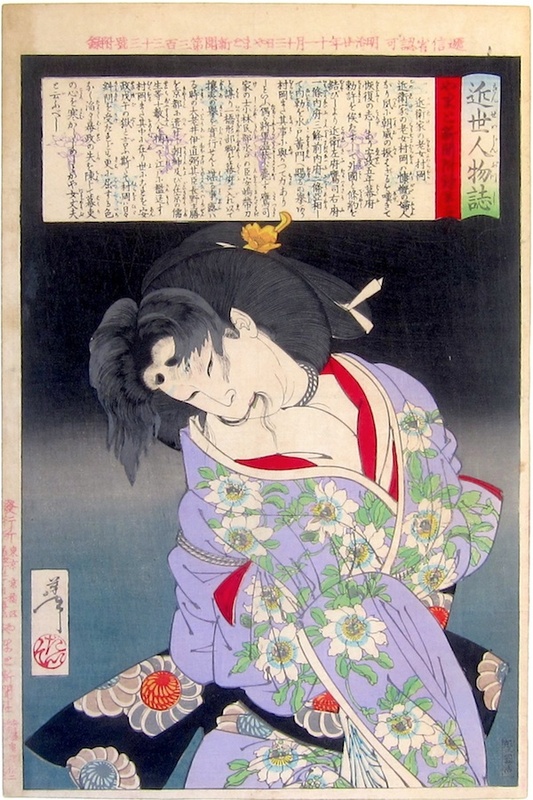 Although it represents the torture of a dissident woman, the drawing and the handling of the figure are exquisite, one of the finest female portraits that Yoshitoshi produced. There is in this portrayal a sensuousness and tenderness that belie the horrid circumstances of the subject matter. Yoshitoshi shows us the chief Lady-in-Waiting of the Konoe Clan and active supporter of the loyalists who opposed the relaxed policy of the shogunate to foreign trade. As a result of her beliefs she was arrested and badly tortured in in 1858 during the Ansei purges. Despite the privations, she remained steadfastly loyal and she became a folk hero following the collapse of the shogunate government a decade later. Muraoka is pictured bound by rope, her figure distorted with discomfort; she holds a hank of hair between her teeth. Yoshitoshi has drawn her much younger than her actual seventy years. Note the blackened teeth and painted eyebrows of a married woman. Surely, Yoshitoshi has pictured her sympathetically since her support for the traditional regime echoed his own conservatism. Compare this print to Kunichika’s series 36 Good and Evil Beauties of 1876. There are noticeable stylistic and graphic influences that Yoshitoshi has taken for inspiration, not least the drawing of the features. The print is full size with complete, untrimmed margins (including printed marginalia). Delicate unfaded colours. First edition, fine impression and condition.